Follow the steps in the instructions posted on this page to learn how to access and submit the Yogi Castle job application online. It should be noted that the online application form that’s available on the company’s website can only be used to apply for retail/shop positions. After your application has been completed and submitted it typically takes the company around 3-10 business days to contact you (if your application meets the requirements/needs of the location that you applied to). Learn more about the company’s online hiring process in the guide posted below. 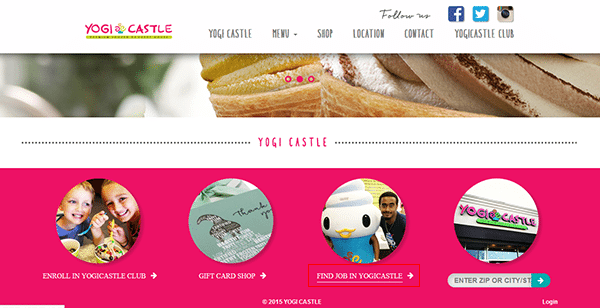 About the Company: Yogi Castle is an American chain of frozen yogurt/ice cream shops. The company operates/franchises numerous locations throughout the United States. Step 1 – Click this link to have the Yogi Castle homepage open in a new browser window or tab. Note: You can also click the button/link at the very top of this page to have the homepage open in your current tab/window. Step 2 – Scroll down the page and click the “Find a Job” link as outlined in the below screenshot. Clicking this link will take you to the main application page/form. Applying for Full time or Part time? Have you been convicted of a crime in the last five (5) years? Step 6 – Complete the “History of Employment” section and then hit the “Submit” button at the bottom of the page/form.